A FEW OF OUR FAVORITE CUSTOM-MADE BIKES! If you’re a business looking for a unique way to expand your market, taking your business mobile may be the way to go. Whether it be a pop up shop, mobile vending cart, or a product display stand, there’s plenty of different ways to go. If you’re really invested, the best way to go would be to create a custom-designed mobile vending system. With custom colors, logo decals, and more, our Ferla Bikes team has worked with several businesses and vendors to create beautiful vending systems. 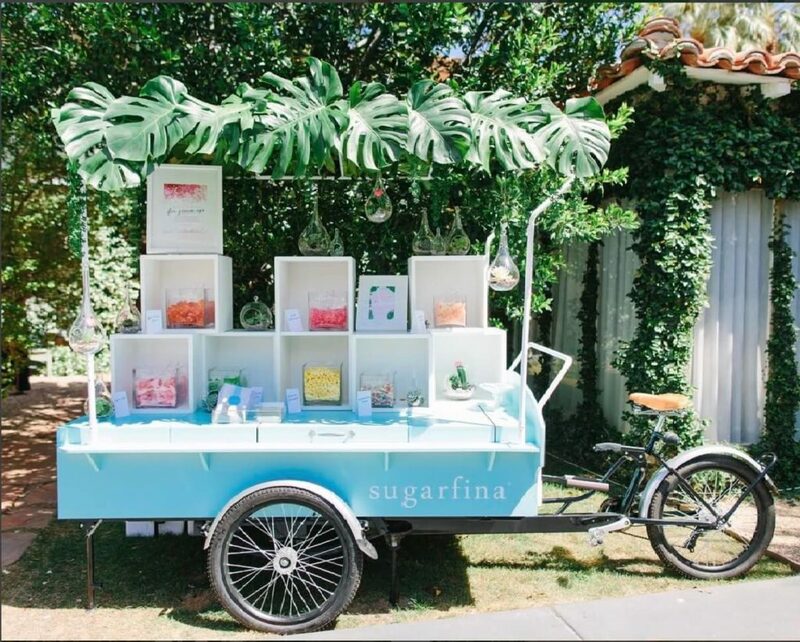 One of our original customized mobile-catering units, our Sugarfina vending bikes were super fun to create. We worked with the team to meet their branding needs, including a custom wrap of the bike’s vending units and a unique canopy, showing off the logo and colors of the brand. In the end, a beautiful custom-made pop up shop design is the result of our efforts. The above features our Ferla Grande, our largest coffee vending bike. 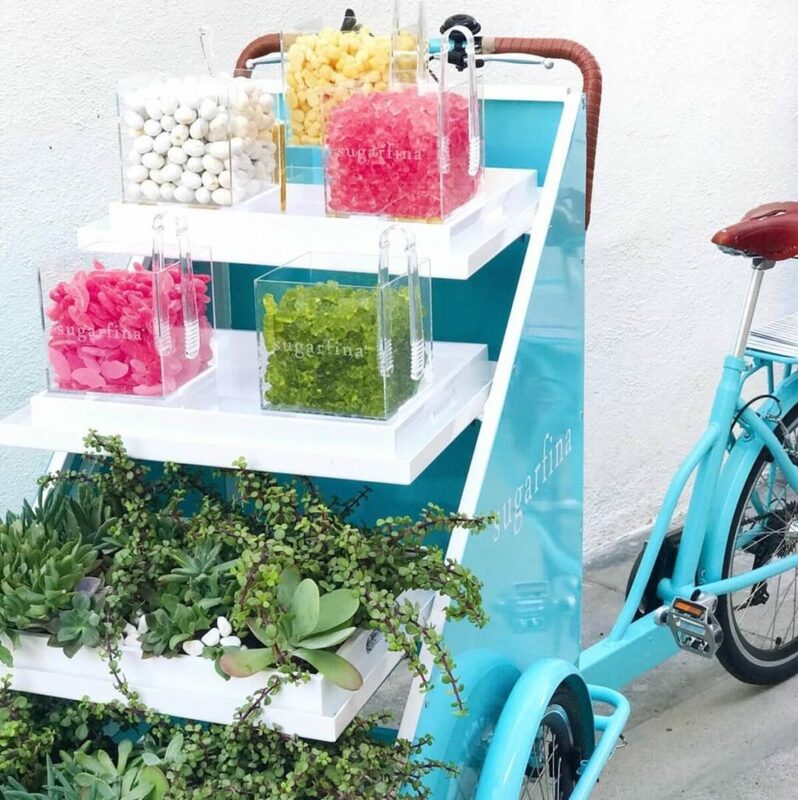 However, Sugarfina took the coffee out and added the candy in – using the unique design to create a beautiful product display stand, and one that’s mobile as well. Once ready to take off the unique tropical-themed canopy design made of philodendron leaves, the canopy made by Ferla is ready to pop back on. In this photo, you’re also able to see the extra storage that this vending unit provides – a simple lift of that front handle, and you can access your excess inventory. 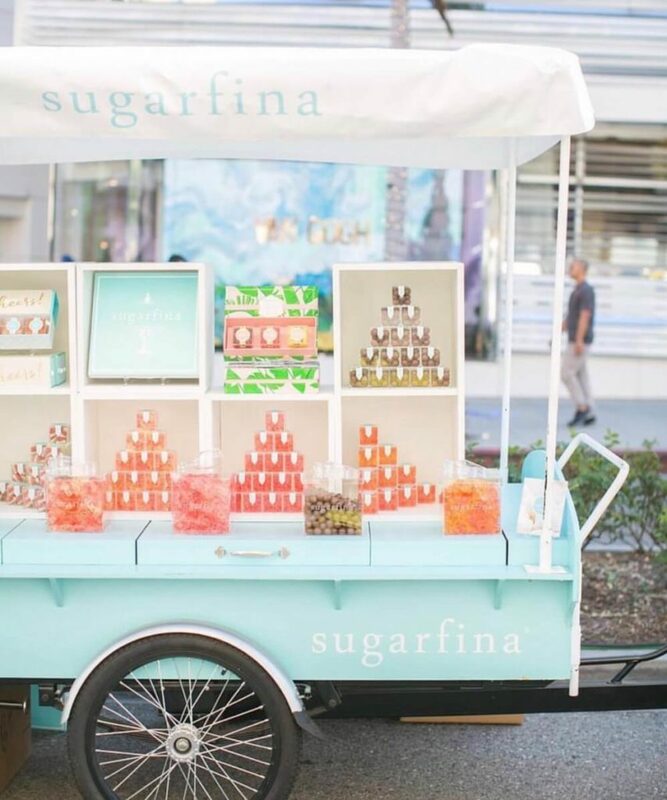 Sugarfina loved our mobile vending concept so much, that they decided to invest in two! The above unit shows a beautiful display of both succulents and sugary confections. Both our Ferla Vendor and Ferla Grande make for a unique product display that’s sure to catch the eye of customers and all passerby. Our project with Uwila Warrior is another mobile vending concept that we’re in love with. 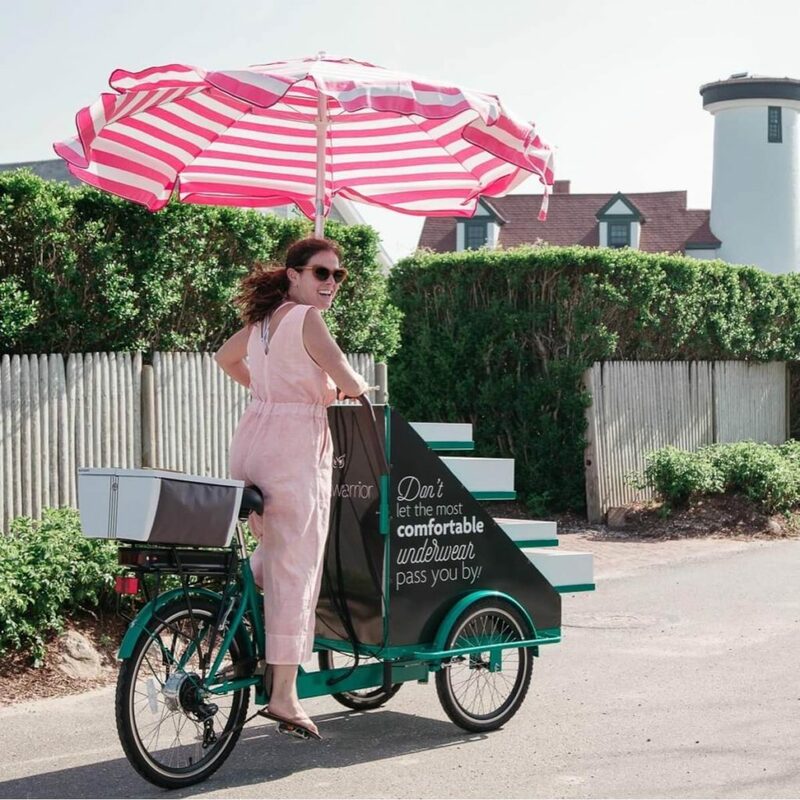 Uwila Warrior started as an online store, but that didn’t stop the team from taking to the streets of Nantucket, using the bike as a unique way to catch attention and thus generate new business. Uwila Warrior requested that our bike have a catchy phrase made into a decal, which we then placed on the side of the vending unit. The bike comes complete with a plenty of space for product display, and of course a battery-operated pedal assist feature to help with travel! Good ice cream is something that most anyone is happy to go for, but if you have your own ice cream shop, how can you be sure that new customers will want to try you over the place down the block? The key can be found in a Ferla Ice Cream Bike, where you can go find the employees instead of waiting on them to find you. 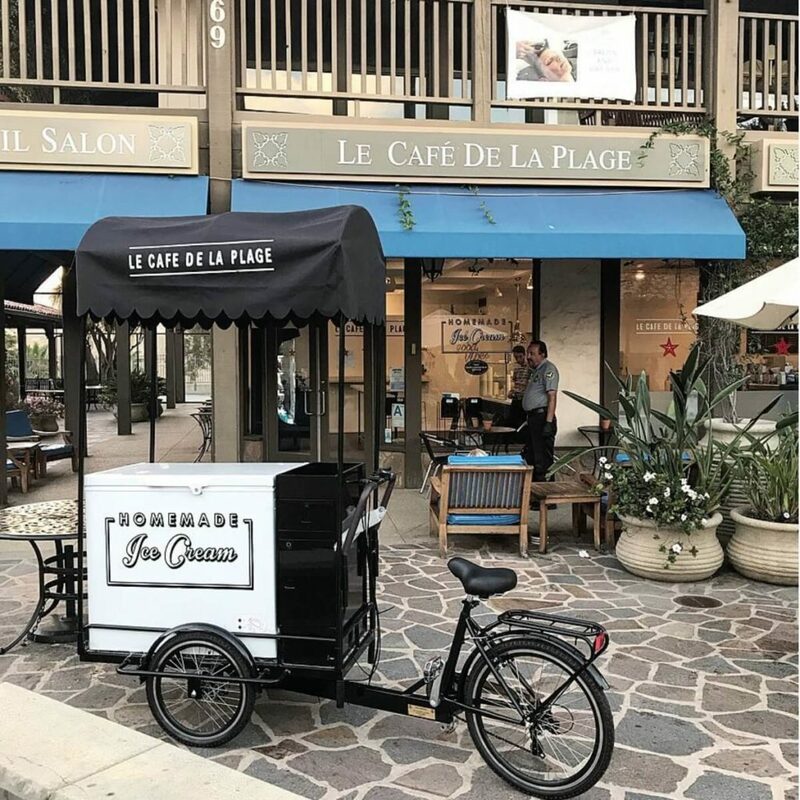 Le Café De La Plage of Malibu decided to proceed with a mobile ice cream shop concept for their business. The best part? Even if it’s just parked outside as a decoration, it still draws attention from pedestrians passing by! We worked with the team of Le Cafe De La Plague to create a unique vending solution that fits the French feel of the brand. A simple black-and-white look, with a painted frame, custom canopy with logo, and a decal for the freezer are a few of the details we took into consideration. We hope you enjoyed reading and got some inspiration from our custom-designed vending bikes! If you’re interested in learning more about how Ferla Bikes can help you with your own custom-made mobile vending solution, then don’t hesitate to request a quote for pricing and more information about our vending bikes.